Have you reached the limits of productivity with traditional hand held pipettes? Would you like to increase your pipetting throughput and reproducibility without investing in big automation? VIAFLO 96 and VIAFLO 384 enable transfers of 96 and 384 samples in a single step, thus increasing pipetting throughput and reproducibility significantly. At a fraction of the cost, they often surpass throughput capabilities of even expensive robots. Choosing the appropriate pipetting head for the application’s volume range helps to achieve the best pipetting results in terms of accuracy and precision. The heads are available in five volume ranges: 0.5 – 12.5 µl, 2 – 50 µl, 5 – 125 µl, 10 – 300 µl and 50 – 1250 µl. Changing a pipetting head is easy and takes less than a minute. VIAFLO 384 can operate with 96- and 384-channel heads while VIAFLO 96 works with 96-channel heads only. All channels of a pipetting head have their own pistons, making every channel independent from each other to avoid cross-channel influences. It is also possible to load the pipetting head only partially with tips. For example load only 8 tips on one column to perform serial dilutions. With its compact design, this benchtop system requires little space on a lab bench and fits into most laminar flow hoods to allow work under sterile conditions. Up to three stage positions accommodate tip racks, microplates, reagent reservoirs or other SBS size labware. Up to 8 microplates can be stacked to make maximum use of the stage positions. The VIAFLO 96 | 384 can also be easily relocated and fit into most laminar flow cabinets for sterile applications. Up to three plate holders accommodate tip racks, microplates, reagent reservoirs or other SBS-size sterile applications. VIAFLO 96 and VIAFLO 384 are compact and use little bench space. GripTips For Reliable Pipetting Results. The GripTips are comfortably loaded and ejected without any physical effort due to a power assisted mechanism activated by a push button. The loading procedure also guarantees that GripTips are not touched by the user and remain sterile. The unique GripTip pipette tips match perfectly with the Tri-Lobe tip fitting to form an integral system. During loading the tips snap over three lobes, which mechanically holds them on the tip fitting. 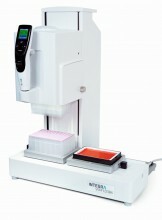 It effectively prevents tips from falling off and guarantees a perfect sealing on every tip to prevent sample spillage. 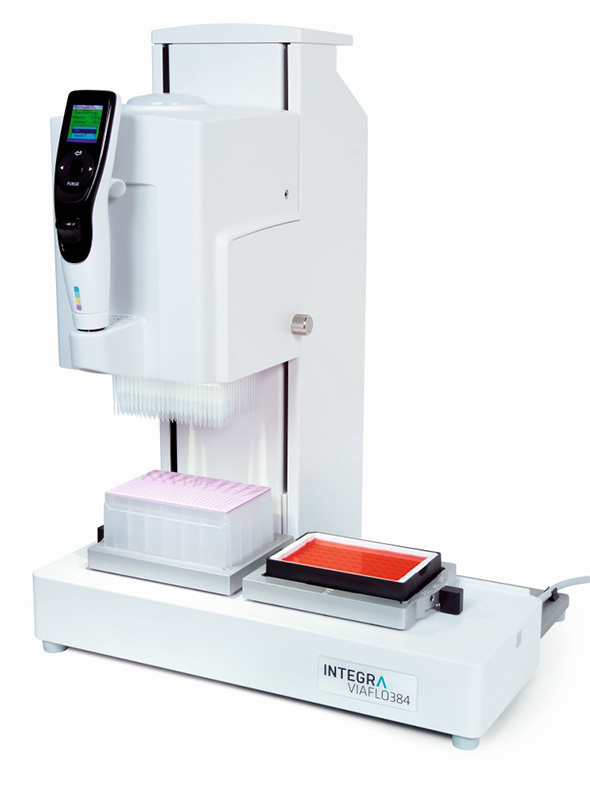 Click the button below to add the INTEGRA VIAFLO 384 Automated Pipetting System to your wish list.